TiTree Resorts is affordable quality when it comes to fully self contained holiday accommodation in the tropical far north. You donâ€™t have to be a millionaire to enjoy the spoils of Port Douglas. Stay here with us and enjoy the spacious units and relaxed atmosphere of Titree. TiTree offers guests quality accommodation for less. 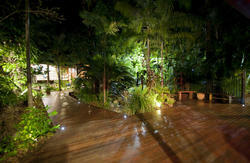 Fully self-contained one and two bedroom Holiday Apartments set amidst lush tropical gardens. See Apartment facilities. TiTree Resort may be 3 km from the main street of Port Douglas but many of our guests find this an added bonus. We are just as close if not closer to the beach than many resorts in town. The dining venues close to us are also very popular with the locals. It is much quieter and the rooms are more spacious. You can always catch the local bus shuttle (nominal charge) to the main street, it picks up every 15-20 mins all day everyday making it no hassle getting around. You can choose to take a walk along 4 mile beach, only a short stroll from your front door. Explore the wonderous Daintree Rainforests, dive the glorious Great Barrier Reef, relax by our gorgeous lagoon style swimming pool or have a game or two of tennis on our full size tennis court get together and enjoy our outdoor dining facilities. See Resort facilities.